Bryan Alexander has an excellent post on the odd situation we find ourselves in which MOOC mania reigns but OER and OCW are seen as yesterday’s news. The mind boggles, and I spent a good ten minutes trying to come up with a metaphor to explain the absurdity of the situation only to find that there really is no metaphor. I suppose if pressed, I’d say that it was as if you’d invented a groundbreaking programming language and found yourself answering 90 minutes of press questions about the “Hello World” program you wrote. But when you tried to talk about the language itself, the reporters replied no, no, no — tell us more about “Hello World”! This oddity became more salient to me as I recently researched a paper on classroom use of MOOCs (for publication hopefully soon, co-written along with Stanford’s Amy Collier and Helen Chen). We’d initially been interested in how the community of the xMOOC interacted with the community of the local class that was “wrapping” the MOOC. Well, we finished the last interviews of practitioners this week, and we have an answer — they don’t. The local cohort and the “massive” cohort don’t interact at all. In other words, as the hype about classroom use of MOOCs is beginning to hit the inflection point, we find that MOOCs in face-to-face classrooms are essentially being used as OER and OCW. For various practical and pedagogical reasons, classes using MOOCs are not in sync with the online cohorts, and frankly the instructors of these classes don’t see that as an issue. Did the use of these xMOOCs as resources change their pedagogy? Oh, yes, radically. These were stories of use I would have died to have had on hand back when I was Director of Community Outreach for the OpenCourseWare Consortium. Their use of these resources expanded what they could offer the students in terms of material (and may even broadened the sorts of courses they could offer). They rethought their approach to classroom instruction in radical ways, and rediscovered the value of giving students close personal in-class guidance on application. And the influence was spreading: at the University of Puerto Rico, we found two professors in the Computer Science teaching their different courses with MOOCs from two different sources — and talking to each other about the implications of this for their program. What to make of this? There’s a lot of cynical (and true) things I could say. Certainly the vast incestuous relationship of Silicon Valley startups and tech journalism has something to do with it — with VC-funded PR dollars to spend, getting MOOCs onto the front page of every newspaper and onto every TV news program is the full time job of an army of well-funded marketers in a way that OER/OCW never was. And the fact it comes from Silicon Valley facilitates the sort of co-dependent backscratching journalism that that area excels in. The message that MOOCs would destroy education (not save it) has also been helpful. The OER/OCW message was rather hippie-ish in nature, and could never tap into the interest of the Lou Dobbs/David Brooks set. It felt too 1967. The MOOC as destroyer meme, on the other hand, has quickly propagated through conservative circles, and with it the hope that colleges (perceived as the last power base of liberalism) will soon be a thing of the past. But I prefer to put those more cynical takes aside for the moment, and ask what it is that xMOOCs as OER offer professors that traditional OER and OCW did not. And I think one of the answers is integration. Traditional OER and OCW required integration of multiple resources by a time-strapped professor. And, as I found when I tried to integrate OER into my own courses, integration is the hard part. A syllabus with readings doesn’t get you that far, and a series of lectures is great, but if you have to write questions to test knowledge of those materials, or even take questions from a PDF and enter them into an LMS test bank — well, it might just be beyond what you can accomplish before the class launches. I talked a bit about this last fall in a post on bundling vs. embedding as ways of structuring reuse. I think what we’re finding is that xMOOCs are showing some deficiencies in our approach to OER. It’s easy to mock instructors who want OER that “looks like a class”, but as our conversations with MOOC-wrappers showed, resources that look like a class can actually help instructors radically rethink their classes by giving them time, space, and a safety net. In short, one of the reason that MOOCs get more attention is that they deal with the hard problem of integration and alignment in a way that OER and OCW avoided for many years. And if we want to reignite a discussion about OCW/OER, maybe we should take a cue from that and solve that problem. Your team spent how many hours building an online course? The false assumption behind that question is that cost of course design at colleges is mainly borne in professor salaries, and that these professors generally get the design done on top of teaching, at a cost of maybe 100 hours of work in a year. By this metric, effort that tends more towards 1,000 hours of design time seems extravagant and wasteful. At an average cost of labor of $40 an hour (health care burdened, etc) that’s the difference between a course that costs $4,000 to develop and $40,000. But, at least for broadly taught intro classes, professor time is not a good metric. The structure of the course, the questions, the test banks, the readings (and now the online practice) are in most cases provided by the textbook company. The sequence is from the textbook, the assessments from the textbook. And while we have the students buy the textbook from our bookstores separately, it’s as much a total cost of the course as professor labor. So what do those design dollars, billed to our students via textbooks look like? If you imagine a moderately sized institution that sends 250 students a year through an Introductory Psych course, then over the course of, say, three years you’ve had about 750 students buy textbooks. A textbook price of $150 is the norm in Psychology, but lets assume the mix of new and used yields an average price of $110. Question: How much has your institution just spent on the design of your Psychology course? Let the quibbling begin about my parameters here — but the broad outlines are pretty solid. The course design costs do not show up on our books, but as a system many colleges and universities are incurring huge off-book course design costs — probably hundreds of thousands in a case like Keene State College, and likely millions elsewhere. And yet we sit around and ask ourselves “How could we ever afford to spend 1,000 hours designing an online course? How can that be sustainable?”. A major new story about Donors Trust was published over the weekend, and it has important implications for higher education. Donors Trust is a sort of money-laundering scheme for causes of the radical right. 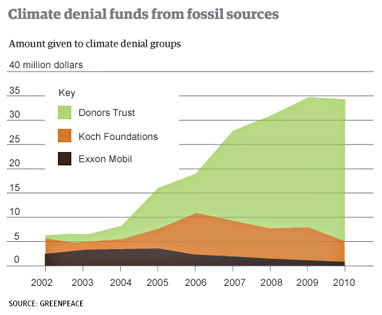 Basically, if you’re an oil company and you want to fund some climate denial science but you don’t want to get your hands dirty, you put your money into Donors Trust (which doesn’t have to report who funds them) and they funnel it into “research” organizations that they directly control. How does this apply to higher education? Well, Donors Trust is also the funding organization behind the Center for College Affordability and Productivity. That’s the organization you see quoted weekly in the Chronicle as a research organization, the one whose director is also a regular columnist in the Chronicle’s “Innovations” blog. And from that perch, they’ve been able to push news stories pretty regularly into the mainstream press. Here’s a link to their latest, which at the time of this post is the “Bartender with a degree” story that is everywhere. I keep saying this in the hope that someone will notice. If Donors Trust is willing to fund research that seeks to create confusion about the science of global warming, what are they willing to do in the much murkier world of education policy? And who is funding that effort? And if we don’t know, should we be quoting CCAP at all? I don’t usually do tools-blogging on this site, but I’m making an exception for Cerego, if only because no one else seems to be blogging it, and it’s the sort of dirt simple tool I love. Cerego is like a number of memorization tools on the market that make use of the insights of cognitive science to help people memorize things more effectively. The short explanation is that the best way to memorize something is spaced repetition, and in general the spacing should be such that you try to refresh your memory just as it is becoming difficult to remember (but not at the point where the memory is lost completely). There’s much debate on how much the precise spacing of the repetition matters, but there’s a broad consensus that spacing matters in at least broad strokes, and that material you have mastered should be spaced out more than material that is still a bit shaky. As I mentioned, there’s any number of tools that try to use these principles to jazz up your average flashcard app. Cerego stands out from the crowd not so much in what they attempt, but in the cleanness of the design and implementation and in the addition of community features (you can easily make your Cerego memorization sets public, and people can rate them). The precision of the “Time until next review” suggestions is a bit pseudo-science, but the review schedules are set up in accordance with decent research (again, it’s just the idea that the program knows the exact minute you should review that is over the top). The ability to add Flickr photos seems superfluous at first, but is a godsend if you are trying to memorize student names, for example, or if you want to come at language memorization from a visual angle as well. The dashboard nicely organizes the different “courses” you are enrolled in (memorization sets, really), and makes it obvious which ones you’d benefit from studying most at any given time. And of course, unlike most other options, the tool is free (at least at the moment). Entry into the beta is limited, but if you click the link at the bottom of this NextWeb article in the next day or so, it should jump you ahead in the queue and give you immediate access (scroll all the way to the bottom of the article to see it). If you put together any interesting sets, let me know — I’d love to try them. This is kind of an amazing video. Cremin is famous for writing one of the definitive histories of education in the United States as well as for his book specifically on the history of Progressive Education in the United States. If you are looking for someone with the long view, this is your guy. He died about a year after this aired, and it’s pretty fortunate this was captured. It gets started in earnest at about 10 mins in. It’s really incredible, I think, how the points he tries to emphasize (as well as the points that the other guest, Mara Mayor, tries to emphasize) are exactly the lessons that tend to get lost when we talk about technology. New technology tends to complement the use of old technology, not replace it. Lack of training and time to train for teachers is the part of technology adoption that tends to bottleneck the process. Technology well used can help traditional teachers focus on the most rewarding elements of teaching. The biggest enemy of technological impact is failure to be sufficiently imaginative in its use and design. What I think is maybe even more interesting is Cremin and Mayor pointing out the many successes of technology in education. We often tend to look at the history of technology in education as a sequence of failures and false starts on our way toward the One Solution That Will Finally Work. But a lot of the time the failure is simply one of insufficient public resources applied to successful models. In places where funding has been significant and long-term (as in the case of Sesame Street) the impact of educational technology has often been phenomenal. Of course, the second thing that is amusing about this is if you replaced the word “video” with “MOOC” you’d get a much more insightful conversation about MOOCs than you are currently seeing most places currently. But start about 10 minutes in, and watch it until the end (20 minutes of your time). I think it’s well worth the historical perspective it provides. Maybe Colleges Should Worry Less About MOOCs and More About Textbook Companies? The biggest ed tech deals of the year were Pearson’s $650 million purchase of Embanet Compass, which provides online learning services to colleges and universities, and John Wiley & Sons’ $220 million acquisition of Deltak Edu, an online degree services company. Both online learning companies have been around since the mid to late 1990s. After watching that, you might assume that I am going to rant against B.F. Skinner. Far from it. In that five minute video Skinner tackles concepts of self-paced learning, the importance of quick feedback, the basics of gamification, aspects of proximal development, and mastery learning. He understands that it is not the *machine* that teaches, but the person that writes the teaching program. And he is better informed than almost the entire current educational press pool in that he states clearly that a “teaching machine” is really just a new kind of textbook. It’s what a textbook looks like in an age where we write programs instead of paragraphs. That’s in 1954, people. I’m a constructivist most days of the week, but nobody really stands as tall in the field of learning as Skinner. Know what? About half of those topics are covered in the five minute video. And covered better than you’re going to find them covered at any THATCamp shindig. As students log on in the computer lab, they access what amounts to an individualized skills plan, the day’s instruction based on assessments that adjust to their performance. The Learning Lab holds 130 students and it’s nearly always full. Once students squeeze into their chairs and pint-sized headphones, the room takes on the hushed air of a study hall during final exams, with each student working at his or her own pace. The title of that news story? Futuristic Rocketship Schools Redefine Teaching. The list goes on and on. You can play this game easily yourself: find a piece on Khan Academy, edX’s machine grading, read a Friedman article, attend a TEDTalk . What we have to stop asking is “Why will this work?”. The answer to that second question might be very plausible — the advances in technology have been incredible. We integrate social elements more seamlessly into technology than we used to. We are networked together. But it’s that question — “Why will this work this time around?” — that really needs to form the starting point of the discussion.